South African OAP, Bonang Matheba has slammed reports that she’s responsible for breaking up AKA’s relationship with his baby mama DJ Zinhle. 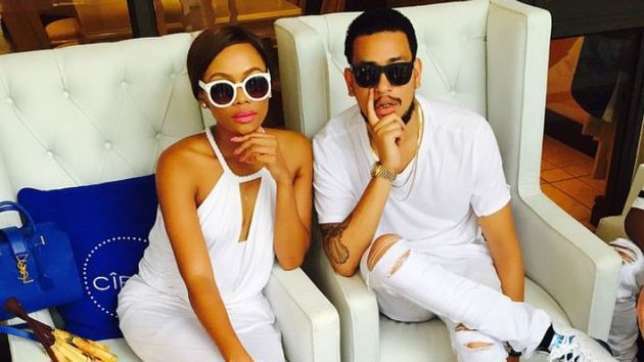 Times Live, a South African online newspaper published a story alleging that Bonang and AKA had a secret affair that eventually broke the rapper’s relationship with DJ Zinhle. Today Bonang Matheba dismissed the rumors on her Twitter account. On August 26, 2015 AKA and DJ Zinhle announced their split. The pair who started dating circa 2013 released a joint statement confirming their split. Bonang Matheba was formerly dating D’banj, the relationship crashed a few weeks ago. Kemi Olunloyo, Has Placed Curses On Critics Who Said She Photoshopped This Photo With Kanye West. Patoranking & Seyi Shay In A Relationship?